JERUSALEM — A 2,000-year-old stamping ring that had been discovered in Israel 50 years ago, but only recently was deciphered, has been found to bear the name “Pilate,” raising theories as to whether or not it could have belonged to the biblical governor of Judea who handed Jesus over to be crucified to satisfy the angry mob. 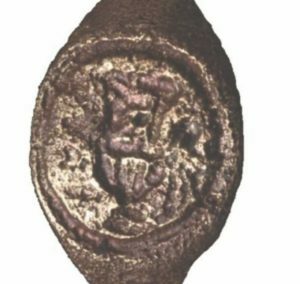 The announcement was published in the Israel Exploration Journal, outlining that the copper ring, found during an 1960’s excavation in Herodion—about three miles from Bethlehem and seven miles from Jerusalem—dates between the first century B.C. to the mid-first century A.D. The artifact was found on the grounds of what was the ancient palace and burial site of Herod, where a number of other items, such as pottery, glass and coins were uncovered. Archaeologist Gideon Foerster is credited with finding the ring, and epigrapher Leah DiSegni deciphered its inscription after its recent cleaning under the direction of Dr. Roi Porat of the Hebrew University of Jerusalem. According to the Jerusalem Post, in addition to bearing the phrase “of Pilatus” in Greek, the stamping ring also features an image of a krater, or a vessel that was used to water down wine. The authors opine that if the ring didn’t belong to Pilate, that perhaps it referred to someone working for the ruler, or to someone in his family. Or, it could have simply belonged to “a local individual” who also was named Pilatus. Porat believes that the lesser quality of the ring doesn’t rule out the possibility that it belonged to Pilate, as he could have used it for day-to-day work while a more expensive ring was worn otherwise. Other theories include the idea that those under Pilate might have used it to stamp his name for him. “There is no way of proving either theory 100 percent and everyone can have his own opinion,” Porat told the Times of Israel. Either way, “it’s a nice story and interesting to wrap your head around,” he said. Pilate is mentioned in all four Gospels, as the disciples of Jesus recounted how the religious leaders of the day handed over Jesus to the ruler, seeking his death as if a criminal. “And straightway in the morning, the chief priests held a consultation with the elders and scribes and the whole council, and bound Jesus, and carried him away, and delivered him to Pilate,” Mark 15:1 reads. The Scriptures state the Pilate knew that the chief priests had turned Jesus over because of their envy, and did not believe that Jesus had done anything wrong. “Pilate saith unto them, ‘What shall I do then with Jesus which is called Christ?’ They all said unto him, ‘Let him be crucified.’ And the governor said, ‘Why, what evil hath he done?’ But they cried out the more, saying, ‘Let him be crucified,'” Matthew 27:22-23 reads.